Growing up, I was always a dog person. When people would ask me what I wanted to be when I grew up, I would answer something to the effect of a dog trainer or handler. However, I could never really have one, as my sister is allergic to fur. But when I was around 12 years old, we were finally able to get a dog: a 5-pound white toy poodle named Tilly. She’s an awesome dog, and I loved her from the moment I met her. Seventeen years later, she is still alive and being as goofy as ever. But as I got older, I knew I wanted a bigger dog. Not huge, just … bigger. So when it finally came time for me to get my own dog, I went to several local shelters with an open mind. Who knew what I would find, or what would find me. Well, an itty bitty pittie found me, and I’m forever changed because of it. Lucy has opened up my life to a whole world of new experiences. Lucy is a great dog. She very friendly with all people (kids included!) and all other dogs (don’t bring a cat around though). She’s been certified as an American Kennel Club Canine Good Citizen and is loved by all of our neighbors and friends. Soon we’re going to start therapy dog training and will hopefully be a working dog team within the year. Granted, it’s come with challenges too, but for the most part, we’ve had a great time. For instance, when my parents first found out I was getting a pit bull, I was almost certain I was going to be disowned. Don’t worry, they’ve been won over by her endearing qualities. And sure, there are the people who cross the street when they see us coming down the block and others who come right up to us. More of the latter than the former, really. But all of our trials and tribulations have forced me to become a very active pit bull advocate. I bring Lucy any place I possibly can, hoping to encounter someone whose perception is “skewed.” We go around showing people how kind and loving, and well-behaved a pit bull can be and that there are many factors that can affect a dog’s temperament. Lucy’s become my ambassa-bull, and I am so proud that we continue to make impactful impressions on people. Since adopting Lucy, I have also become a foster parent for homeless pit bulls and have housed five so far. I’ve even started a blog about it called That Touch of Pit. Those five dogs have had widely varying temperaments, came from wildly different backgrounds and histories, but each of them have done their part to become positive influences for pit bull type dogs. The really wonderful thing is that having a dog has allowed me to connect with other people in my community on a different level. So many people in the theater community are dog lovers, and being artists, we’re all very open minded people. 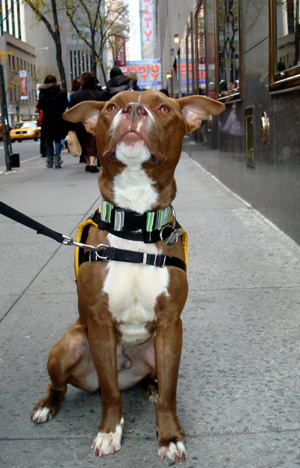 Broadway folk are a diverse group of people, and just like our beloved pit bulls, come from a wide variety of races, creeds, religions – we’re all unique individuals. My coworkers and peers have welcomed all of my dogs into their lives, and many of them have pit bulls of their own. With the stories to come in the following weeks, my hope is to show the diversity of the people who have and/or love pit bulls. These stories will be more about the people and their lives with their dogs. Hopefully, the world will begin to understand through the tales of my Broadway friends that not only is it unfair to stereotype our pets, but it’s also unfair to stereotype us. About the author: Josh Blye works as the social media manager for Broadway Cares/Equity Fights AIDS, one of the nation’s leading industry-based HIV/AIDS fundraising and grant-making organizations. He is also a sub-assistant stage manager at Broadway’s The Phantom of the Opera. 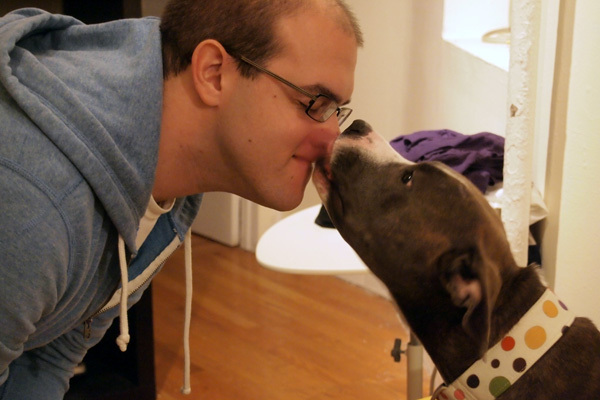 Two years ago, Josh adopted a pit bull who he named Lucy and has since become a very outspoken pit bull advocate. 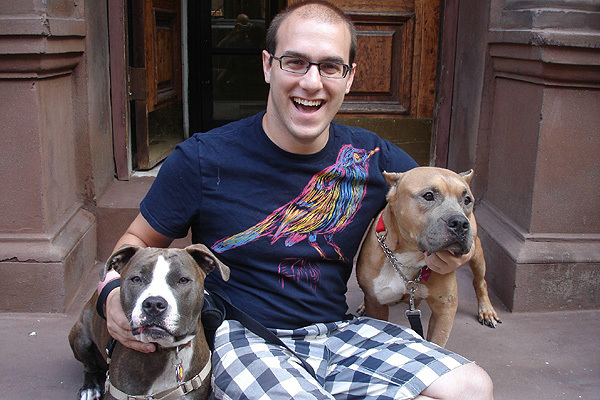 He is one of the co-authors of the blog That Touch of Pit, on which he writes about his experiences as a pit bull guardian and foster parent in New York City. 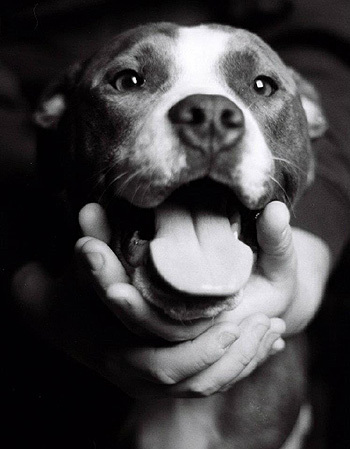 Welcome to the wonderful world of pit bull guardianship! Your story echos the sentiment here and all bully breed lovers I believe. It’s funny how we think one is good enough however, there’s more to be done and we do it with almost no hesitation. Thanks for sharing and look forward to more stories from you & broadway friends!